St James’s Park is a Royal Park with an area of 23 hectares and lies directly to the east of Buckingham Palace which faces out onto the park. The park is roughly triangular in shape with the base of the triangle being Horse Guards Road to the east, the ceremonial road The Mall forms the northernmost side of the triangle and Birdcage Walk the southernmost side. Lawns, flower beds, trees and shrubs surround an elongated lake with two islands. A bridge across the lake gives magnificent views of Buckingham Palace to the west framed by trees and the lake, and the Foreign and Commonwealth Office to the east. 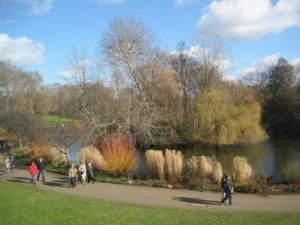 The park is yet another part of the land requisitioned by King Henry VIII for his addiction to hunting deer (see Hyde Park and Greenwich Park). It was subsequently opened to the public in the 17th Century by King Charles II. After this the park became well known for robbery amd prostitution. Today the landscaping designed by Nash in the !9th Century is enjoyed by all. 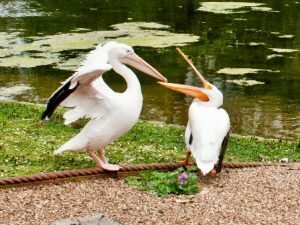 The lake is home to a diverse range of waterfowl including a colony of pelicans which have developed an appetite for the local pigeons. They were a gift from the Russian Ambassador to King Charles II in the 17th Century and haven’t gone away since. One enterprising bird apparently makes a trip to London Zoo at lunchtime to share the animals’ meal of fish.